Seventeen million adults – nearly half the working population – have the math skills of a child at primary school, a report revealed yesterday. Their grasp of numbers is so poor that they struggle to work out deductions on their pay slips or calculate change. The number who struggle with basic numeracy has grown by two million over the past decade, even though billions of pounds has been poured into schemes to improve standards. 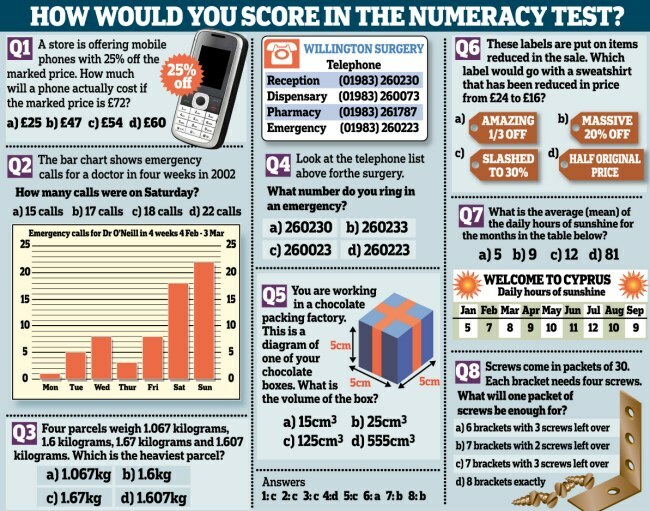 How would you score in the numeracy test? The scale of poor numeracy far exceeds the equivalent figure for poor literacy, which is now five million. The report, released by a new charity, National Numeracy, found that 49 per cent of working-age adults in England are so bad at math that they have no more than the skills expected of a nine to 11-year-old and would struggle with graphs and charts. About half of these adults – a quarter of the working population – have only the abilities expected of a seven to nine-year-old and might struggle to pay household bills. Launching the report, National Numeracy said school-leavers who have failed to master basic math are more likely to end up jobless, in prison or pregnant at a young age. The charity said Britain’s low numeracy levels, which place us 17th in a global league of 30 nations, are partly due to decades of neglect of math in schools. But it also blamed a prevalent attitude that it is a ‘badge of honor’ to be bad at the subject and to have a ‘can’t do it’ attitude. ‘Official Government figures quote that 17 million people have math capabilities, at best, of the age of an 11-year-old. ‘And actually half of that group’s capacity tends to operate down around the level of a nine-year-old. ‘That’s a scary figure, because it means that they often can’t understand deductions on their payslip. ‘They have problems with timetables, they are certainly going to have problems with tax and even with interpreting graphs and charts that are necessary for their jobs. ‘The truth is that numeracy has been hidden behind literacy. Mr Humphries lamented that math had been ‘downgraded’ in the UK, particularly from the 1970s on-wards. He said there was no ‘straight answer’ to the question of why Britain had a poor attitude to math, but included a ‘stronger focus that we have had in this country since the [Second World] War on the arts and humanities and social science’. Mike Ellicock, chief executive of National Numeracy, said: ‘We want to challenge this “I can’t do math” attitude that is prevalent in the UK. ‘It’s often a boast or a badge of honor, and that’s across the whole of the social spectrum. ‘A huge part of the message is breaking down this view that’s held in this country that math is a “can do, can’t do” thing, that it’s genetic, “I can’t do it, my mum couldn’t do it” and that kind of thing. A poll for the group found that 80 per cent of adults questioned would be embarrassed to say they could not read or write properly, yet only 56 per cent would be ashamed of admitting they were bad at maths. The new organization, whose founding sponsors alongside Nationwide Building Society include the Rayne Foundation, Oxford University Press and John Lyon’s Charity, is the first dedicated solely to boosting numeracy skills. It is backed by Rachel Riley, the mathematician on Channel Four’s Countdown. Endorsing the charity’s aims, BT chairman Sir Mike Rake said: ‘Poor numeracy is the hidden problem that blights the UK economy and ruins individuals’ chances in life. Posted in Britain, Crime, innumeracy, Math, Multiplication, Multiplication Tabe, Nation, Numeracy, Times Table and tagged Bad at maths, bottom of developed world, Britain, charity, Department for Education, Education, Innumeracy, innumeracy in Britain, Innumerate, Maths, Multiplication Table, Nation of dunces, National Nummeracy, OECD, unemployment.